I'm usually never into going to networking events but my friend, Chandra, convinced me to go and I gave it a try. Twestival Toronto was surprisingly a fun event and it was great to see friends randomly there. Emily M and I had arrived there early to find a very promising yet awkward event. We shouldn't have gone there early and it didn't really become fun until our other friends arrived. The music started playing and we joined the other room to see the Twidol competition. My friend from Hill and Knowlton was in the competition but I'm not sure if she won or not. All I know is that I recorded a lot of hilarious videos that I won't upload for the for the betterment of the contestants. I'll make sure not to delete them and keep it for a rainy day because the videos really are hilarious for when I need cheering up. 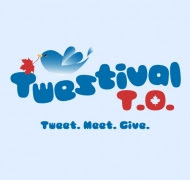 Would I go to Twestival again? It was a fun event but since it was my first time, I didn't know what to expect and since I had work the next morning I kept things at bay. I think I might give the event another go next year but I'm going toinvite a lot of people with me next year. Twestival seems like the event that is fun with the right amount of people.